UDM Downloads > VidMorph PRO! Mix Video and Image morphing in one media. Create video effects from digital photos, images, home videos, movies. No technical skills required - anyone can make a photo animation in just seconds! Save morphs in Flash, WMV, ASF, AVI, Animated GIF, ipod mp4 video, 3gp mobile video and other popular video formats. VidMorph PRO is easy to use VidMorph PRO is far less expensive than complex animation software, yet offers fully professional morphing results. And, of course, it's fun! You'll feel like an artist and a comedian all rolled into one with your first morph. Movie morphing create more realistic transitions and used in a professional .video studio, but now your can mix video morphing and photo morphing in your home computer! 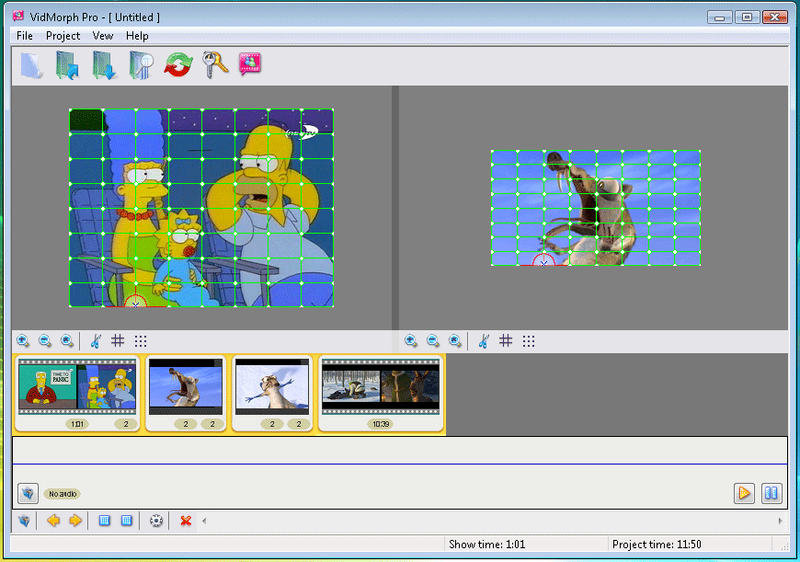 VidMorph PRO allows you to mix several images and video to one film. Each morphed media moves smoothly - a technique widely used in the film industry. Multy-morphing is available for all. Mix Images and Video to professional animation with VidMorph PRO.